Dampier Street was named after Thomas Dampier, a wealthy glove manufacturer with a glove factory and dressing yard to the north of Reckleford which was probably located on the site where Dampier Street lies today. The Dampier family had, from the end of the sixteenth century, been associated with the Manor of Kingston. A short row of houses was built along the eastern side of the road, which was named in 1883. On the opposite side of the road was the Reckleford Board School which had opened in 1876. Most of these houses had been demolished by about 1960, the last pair of houses were demolished as part of the widening of Reckleford. Modern dwellings have now been built along the eastern side of the road which now joins Kiddles, a housing development built off Eastland Road. At the northern end of Dampier Street, on the north side of the track leading to the brick kiln, a short terrace of four dwellings called Dampier Place had been built by 1900. The houses of Dampier Place are the only Victorian houses in the immediate area that survive. 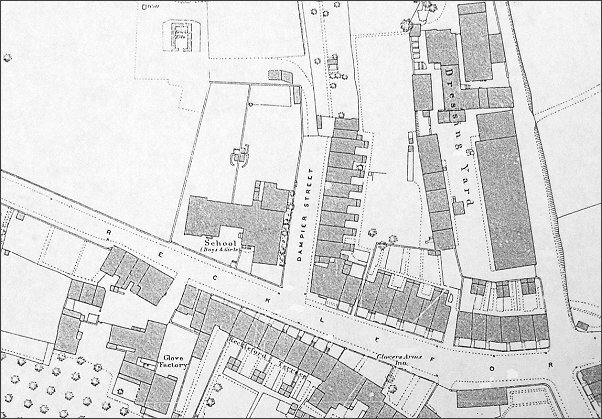 Map based on the 1886 Ordnance Survey showing Reckleford running across the map with Kiddles Lane (now Eastland Road) at right. Dampier Street is at centre but Dampier Place had not yet been built and was simply a track leading off west to the brick kiln, seen at top left. 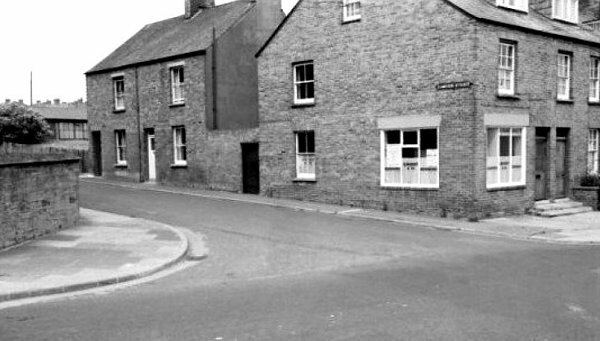 A 1960's photograph, taken from Reckleford, showing the entrance to Dampier Street. By this time most of the original Dampier Street houses had already been demolished and those in this photograph would fall to the widening of Reckleford some ten years after this photograph.